LEE GREENWOOD, TIM ATWOOD AND PATRICK JAMES BAND CELEBRATE MEMORIAL DAY | 2911 Enterprises, Inc.
NASHVILLE, Tenn. – Grammy-winning Artist Lee Greenwood kicked off Memorial Day weekend Thursday night at the Intrepid Foundation Gala on the Intrepid Sea, Air & Space Museum in New York City, Friday morning on the Fox & Friends All-American Summer Concert Series, and Sunday performed “God Bless the U.S.A” at Charlotte Motor Speedway during NASCAR’S Coca-Cola 600. 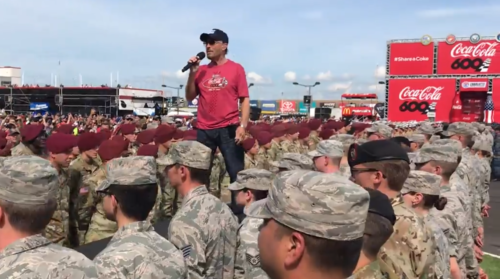 This year’s awe-inspiring pre-race salute to the troops included ground exhibitions and a 20-minute performance by the 82nd Airborne division. “I’m blessed and honored to have the opportunity to pay tribute to the men and women of our great nation who serve and sacrifice daily to defend our freedom,” said Greenwood. Tim Atwood‘s forthcoming solo album, Livin The Dream, features the patriotic anthem, “I’ll Stand Up and Say So” which has an equally patriotic story behind it. Patrick James Band is also readying his debut solo album, Ride Of A Lifetime, with the first single from the project – the inspiring “Thank You.” Patrick says it’s a song of gratitude for everyone in uniform who has fought to protect our freedoms. He just wanted to thank them personally with a song.